Most people think of a landscaping nursery as a place to find the plants and people to achieve a picture-perfect lawn, providing they use the right sprays on their stretches of grass. 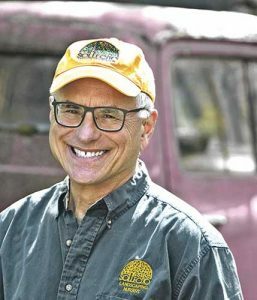 Jim Sollecito, owner of Sollecito Landscaping Nursery in Syracuse, NY takes a different approach. For one thing, he incorporates fruit-bearing plants and trees as part of his “Living Landscapes” at homes and businesses. Examples include Polana red raspberries and Bristol black raspberries. Sollecito earned a bachelor’s degree in Ornamental Horticulture from Cornell University and has been in business for 44 years. He is a New York State Certified Landscape Professional who works with plants, trees and structures to augment his customers’ outdoor space. He said that few people ask for edibles, but when he suggests them, they’re usually open to the idea. Initially, many customers are afraid they will have to spray the plants, but Sollecito says it’s unnecessary. Sollecito favors plant-based installations and using organic controls to reduce if not eliminate pesticide spraying. Strategies such as planting the right variety on the right rootstock in the right location makes a big difference in minimizing insect damage. Sollecito also adds plenty of crab shell and compost to the planting pit to deter pests. Insects love overgrown plants, so pruning yearly, along with promptly removing problem fruit, decreases the plant’s attractiveness to bugs. Since he grows more than 800 varieties of sustainable shrubs, trees, perennials and edibles, he can offer clients plenty of options. He also grows “signature plants” unavailable elsewhere. Sollecito likes to work with the environment. He is careful to stock plants suitable for central New York’s climate and soil type. Using the right strategies can help reduce loss to pests. For example, he likes to graft gold rush apples onto EMLA 111 rootstock to grow edible apples that don’t require spraying and when clients “want fruit that lasts as long as the Energizer Bunny,” Sollecito said. Sollecito likes Kousa dogwoods and Cornelian cherry dogwoods, which both bear edible fruits. “Both fruits are delicious and something neat to munch on in the fall after they ripen,” Sollecito said. He said that Kousa fruit may be eaten like a concord grape, popped from its skin into the mouth. “Cornelians are much like cherries in September, but you need to wait until they are fully red or you will pucker right up,” Sollecito said. Adams and York elderberries can provide both a thick privacy barrier with attractive blooms that develop into fruits that attract both birds and people. Sollectio uses York and Adams in the same area for cross-pollination. Many clients want their landscapes to offer color throughout the summer. Hydrangeas have become so popular that he carries 17 varieties. Weigelas are also in big demand. Customer requests drive many of the ideas that drive Sollecito’s business. “In central New York, it’s time to remind clients to plant for fall with warm soil and cool evenings,” Sollecito said. By helping clients plant at the right times, he can help them achieve better success with their landscaping and generate more repeat business. Sollecito enjoys sharing his horticulture knowledge with customers at home and with others abroad. For the second straight winter, he took organic seeds, school supplies and fishing tackle to people in Cuba. “This trip I was better prepared because I knew things that they could grow and sell,” Sollecito said. Sollecito believes that continually learning about horticulture has helped him continue to succeed in the business.